Front row (left to right): NSCDA-NC President Sara Larkin, Burgwin-Wright House Museum Director Christine Lamberton, NSCDA-NC Executive Director Joy Allen. Back row (left to right): Burgwin-Wright House Museum Lead Interpreter Caitlin Simpson, Burgwin-Wright House Committee Chair Mary Gornto and NSCDA-NC Administrative Assistant Allayna Dail. 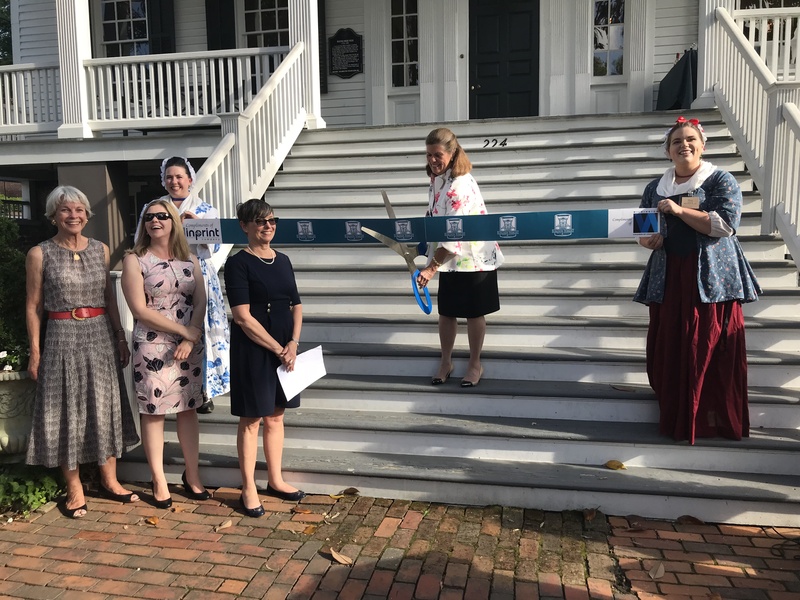 The NSCDA-NC and the Wilmington Chamber of Commerce held a ribbon cutting ceremony on Tuesday, May 22 to commemorate the completion of numerous large scale preservation projects at the Burgwin-Wright House that culminated in a transformational interior restoration. Floors were refinished in the parlor, dining room, bedrooms, study and library, bringing out the rich hues of the old growth heart pine floors. Repairs were made to the plaster and woodwork, after which the rooms were painted with colors that match the original palette used at the time of the home's construction in 1770. NSCDA-NC executive director Joy Allen referred to the interior restoration as the project with the "wow factor". 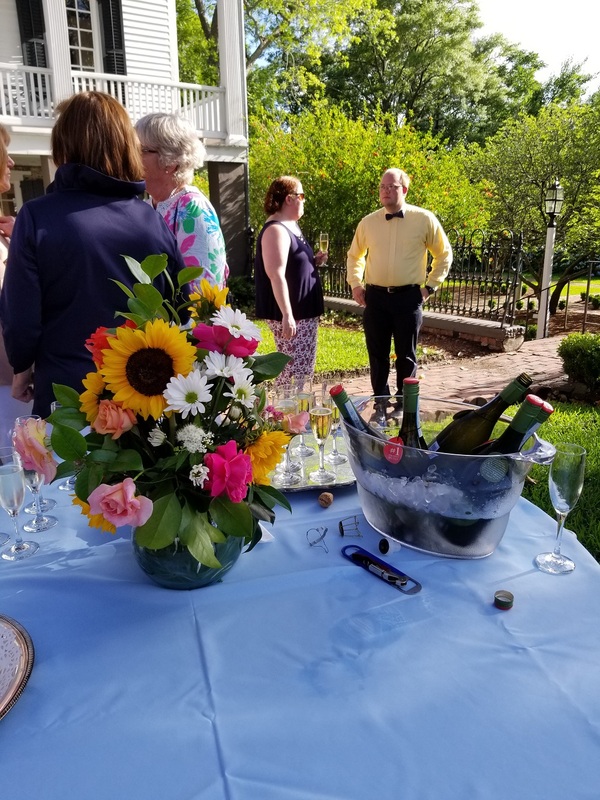 The ribbon cutting event took place on the front lawn of the Burgwin-Wright House, where attendees were greeted with flutes of champagne. Burgwin-Wright House Committee Chair Mary Gornto opened the program with welcoming remarks and acknowledged distinguished guests that included local elected officials, historians, museum professionals, preservationists and representatives of the tourism authority. Many NC Dames also attended, including six past presidents of the Society. Joy Allen began her remarks by asking the audience to imagine that they were standing in front of a gas station, explaining that would have been the fate of the Burgwin-Wright House property had it not been saved by the NC Dames. She spoke about the historic significance of the property that includes four of Wilmington's oldest and rarest structures: the ballast stone walls of the 1744 city jail that in 1770 became the foundation of John Burgwin's town home, two exterior jail cells and the former jailor's quarters. Allen also briefly enumerated the preservation work completed during the past 18 months and acknowledged the benefactor of the interior restoration, Mrs. Lillian Bellamy Boney. A life-long preservationist and a member of the Colonial Dames for nearly 70 years, Mrs. Boney received a round of applause from the audience. 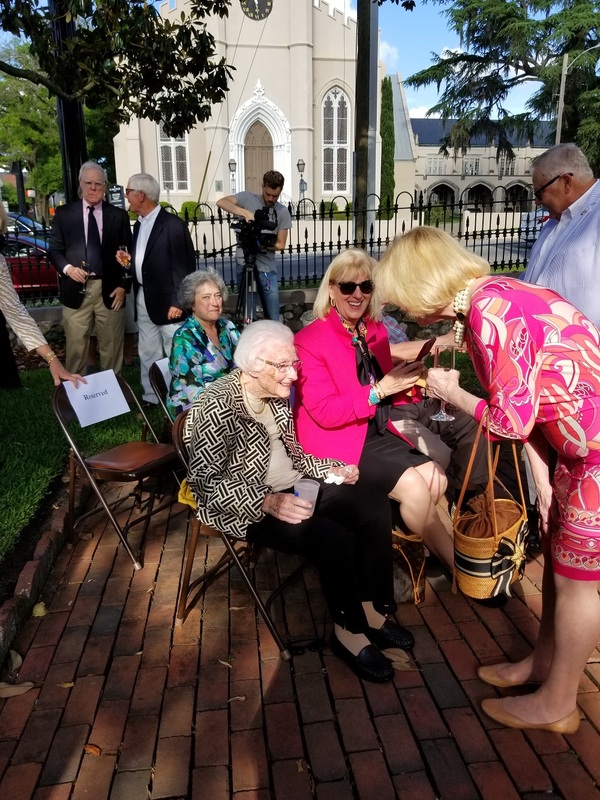 President and CEO of the Wilmington Chamber of Commerce Natalie English lauded the preservation work of the NC Dames and recognized the significance of the Burwgin-Wright House as an anchor property of the Historic District. Burgwin-Wright House Museum Director Christine Lamberton spoke briefly about the importance of the museum as an educational institution. Lamberton then recognized restoration contractor Ken Earp as well as Caitlin Simpson, who wrote the museum house's new furnishing plan. Implemented immediately after the restoration, the furnishing plan is authentic to the colonial period. 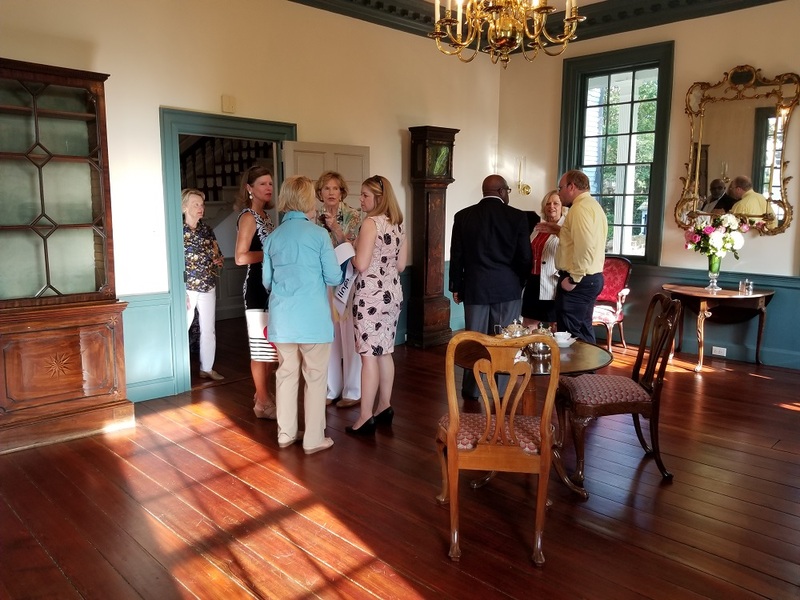 Current NSCDA-NC President Sara Larkin gave the closing remarks, inviting guests to tour the house at their leisure and to enjoy refreshments available on the front and back porches. Mary Gornto cut the ceremonial ribbon signifying the beginning of the true celebration.